Regular readers of this blog may recall my husband and I recently sold the homestead and are building a new home. The new place is being constructed with timbers cut from trees the resident biologist (and past lumberjack) cut and milled a few years ago. Since we've owned this property for many years, we indulged our deliberative tendencies and observed the land and its environs over the course of many seasons. Seventeen years worth of observing and discussing led us to choose a beautiful sunny spot overlooking a lake for the new home. The Adirondack High Peaks seem to spring out of the lake, itself bustling with ducks, geese and herons. The site work was completed last fall and we are now building a house. I should say, I am helping build a new home; Ed is in charge and I do what I am told. Yes, it happens occasionally. As I mentioned, I plan to keep this blog updated with the progress of building an authentic Adirondack timber frame home. Today's home building excitement was all about cement work. After a weekend of preparing the ground, the slab was "poured" this morning. 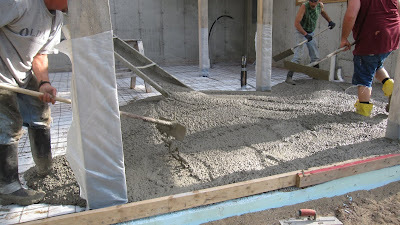 I never understood why they called it "poured" until early this morning when I saw the cool, spinning round truck pouring cement into my house. The foundation and first floor of post and beams are already completed, so it really looked like they were pouring cement into a house. The men in today's featured photo are wearing Adirondack cement shoes, which are functional for a living person, unlike the cement shoes familiar to my family and friends in New Jersey. To those of you who read this blog for outdoor recreational reports and couldn't give a hoot about building a house: get up here to recreate, it is gorgeous outside! The temperatures have been in the lovely 70s and 80s, the sky is clear and blue, and the views from the road demand a cyclist's pace. I have to go leave my mark on some freshly poured cement that is starting to 'set up,' and the bike is ready to go. Recreation AND house building works too.